Post what you play during the week of Monday 16/Sep/13 to Sunday 22/Sep/13. Post your ratings and/or any thoughts on the games played. Wednesday I played Stone Age with 2 other experienced players and a newbie. He did pretty well, but still ended last. I got too spread out in strategy, and ended up third, with some distance to the first two, because I had to take a 10 point penalty at one point. I rate it a 7, as I might turn down a game of Stone Age for a new game. It's a pretty cool game, though. Then we played a round of Love Letter, to fill some time. My last game that night was Lords of Waterdeep: Scoundrels of Skullport. We played with both extra boards. We didn't finish due to time, but I really liked the expansion. I think it adds more flexibility to the game, as you can either try to avoid corruption, or find a steady way to get rid of it and try to get that extra edge. I rate the main game a 9, and this expansion is also a 9. 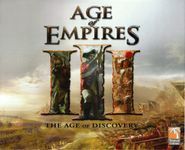 Saturday, I played Age of Empires III: The Age of Discovery, and got my first win! It was close, won by 3 points, mostly on capital building points and trade goods. I really like this game, but again, this is only a 7 for me, as I might turn down a game of this for something else. It's a long and mentally tiring game. Another game of Stone Age, where I did better, but not much. When one pile of huts was being bought from exclusively, speeding up the game, I tried to focus on points more than building any combo up, but rarely got breaks with available choices, and often found myself close to not being able to feed my people. This was the first time I noticed that seating arrangement matters in Stone Age. We had a newbie seated before the most experienced player, and me afterwards. The expert ended the game with 7 agriculture, 10 people in his tribe, 8 tools, loads of multipliers for those, and the only person close to him was the player between me and the newbie. The only reason I wasn't further behind was that I got 7 symbols. We ended the night with a quick game of 3 player Sushi Go! mostly to teach them both the game. Me and one of the players had pretty close scores, and the other one beat us by more than 10 points. Still a great game. Currently an 8, but might upgrade it to 9 if it keeps on being as fun as it's been. Update: Sunday, had a round of Lost Cities, which I really like. The game is pretty simple, and has a good mix of randomness and strategy. It has some pretty difficult choices to make when you're playing, and yet, still easy to teach and fast to play. I had it as a 7 before, but upgraded it to 8. I don't think I'd turn down a game of it. Also played two quick teaching games of Hive, which I like to play, but have a hard time having good games while teaching. Lastly, played a 3 player game of Amun-Re that was pretty close: The winner and me had the same points, with her winning on pyramids tiebreaker, and the third place was one point behind us. I made a big mistake on the first age, not completing a pyramid and leaving stones behind, by miscalculating how much stone I needed to finish two incomplete pyramids. So I went into the second age with little money, but without the point advantage I wanted. Which kinda sucked as one of the players had invested on making money, and did not build anything on one province. I got stuck with that province, and going for two sets got expensive. Didn't get a majority on either side of the river. The money player did make a big mistake pretty close to the end, though, which cost her at least 4 or 5 points. She still won. Still a 7, as there might be some occasions where I'll turn down playing it, but it continues to be a great game. Four-player Lords of Waterdeep: Scoundrels of Skullport with the boardgame group. Remember how I said the start-player marker doesn't seem to move as much with an expansion board out? This game it literally was never taken the entire game. A big part of that was E seeding the Castle Waterdeep space with a corruption token early on, which was intended to mess with K since he was looking for intrigue cards but actually ended up locking the turn order since nobody was willing to take the VP penalty. That put me in fourth permanently, but since I did the Magister's Orb early it wasn't as much of a problem as it would normally be, and others were using the Zoarstar for the same thing. A bigger issue was that A was first for the whole game, and it turned out he was the builder lord. And got the quest that gave him 4VPs for every building he built. And the quest that gave him two extra buidings. And the quest that gave him a bonus 2VPs for every building he had built. He rocketed ahead, unsurprisingly, but he was left with corruption at the end which brought him back down a bit. I'd done well with keeping to my quest types, but I ended up with a plenty of adventurers and quests left at the end. Glad I never did the one that gave a reward for using the Castle space, at least, but inefficient play cost me at the end. I also never took corruption, as I never had any way to get rid of it. I ended up closer to A than I though, but not quite enough to ovetake him. 130-126-109-92. First try at the Agricola More Buildings expansion with the sproglet. Same as before, really; he needs to work on long-term planning and concentrate on what gives him points at the end of the game - for example, he completely covered his starting board in small pens and didn't have any fences to move into his expansions. His short-term play is still fine, and he took the juicy spot I was planning to a couple of times. He ended up getting bonus points for leftover resources, while I gathered a huge number of animals and won 64-27.5. Quick game of For Sale with K and the sproglet before bed. I was sitting clockwise from him, and at the start of the game he kept bidding high from the start, leaving me choosing between either bidding higher or dropping out and giving K the middle card for free. She wound up with most of her money still in her stack at the end of the buying round, while I was cleared out but had the best properties. I did well at the start of the selling round but missed a couple of good deals later on. I got just enough to overcome her eleven-point cash lead, but it turned out the sproglet beat both of us. Final score 75-71-68.